Strangers holed up in a house for a reality film deal with a scary menace. Thanks to the success of 1996’s Scream, horror flicks enjoyed a nice resurgence in the late 1990s. This wave of attention didn’t help 1999’s Kolobos, though, as the low-budget effort received poor distribution and fell into the vast vat of obscurity. If I heard of Kolobos 20 years ago, that memory left me a long time ago. Nonetheless, I maintain recollections of the post-Scream era of horror, so I wanted to see how Kolobos compared. Artist Kyra Mitchell (Amy Weber) responds to a recruitment effort to gather people for an experimental film. In the vein of reality TV, the producers will gather a household of strangers who will live together for three months, all under the constant gaze of the camera. Initially this seems innocuous enough, but eventually, outside parties secure the residence so that none of the inhabitants can leave. This leads to a series of violent encounters that threaten Kyra and the others. A glimpse at the promotional materials that accompany Kolobos convey the impression that the film suffered its obscurity due to poor marketing. The text relates that the ads sold it as just another slasher flick in which pretty young people met their demise. Perhaps a broader marketing scheme left that impression, but the movie’s 1999 trailer at least hinted at the film’s unconventional side. While it indulged in some heavy-handed narration, the promo still didn’t seem to present Kolobos as just another Scream wannabe. Now the studio definitely pushes the “lost classic” angle and implies that Kolobos boasts a level of oddness and intelligence unusual for the genre. Good luck with that! Kolobos might be “lost”, forgotten, or – more likely – never known in the first place, but I can’t claim this equals tragedy. Amateurish and self-conscious, the film fails to become a worthwhile horror tale. Not that I dislike the premise, though, as the “reality show” idea comes with some promise. It’s not the most creative theme to lock people in a “haunted house” and watch them struggle to survive, but the basic notion could offer some good thrills. Unfortunately, Kolobos can’t leave well enough alone. Rather than just focus on this simple but potentially effective plot, the filmmakers suffer from delusions of grandeur that prompt them to shoot for something more grandiose. That means Kolobos integrates aspects of Kyra’s mental illness to put the audience on edge – theoretically. While these elements should force the viewers to question the reality of the situations, instead they just feel like pretentious window-dressing. 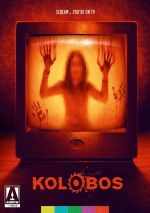 Kolobos fails to marry its hallucinatory side with its simple horror bent, and the product suffers as a result. Maybe a movie more fully devoted to one theme over the other could’ve developed in a dynamic manner. Though probably not, as the amateurish nature of Kolobos turns into a consistent negative. In particular, the actors sabotage the film at every turn. Weber later gained fame as a pro wrestler, and as seen here, her skills seem suited for that domain. While pretty, she can’t play a convincing human, so her move toward the broad world of the WWE makes sense. None of the other actors fare better, though. All over-act and bring performances that lack the necessary tones to imbue the roles with personality or life. Kolobos throws out some graphic gore, and that might suffice to interest the genre addicts. As a film, though, it falters and never develops into anything worthwhile. Kolobos appears in an aspect ratio of approximately 1.85:1 on this Blu-ray Disc. The image was watchable but erratic. Sharpness became one of the inconsistent elements. Much of the film showed fairly good accuracy, but more than a few oddly soft shots occurred. Definition lacked real consistency. No signs of jagged edges or shimmering materialized, and I saw no edge haloes. As for print flaws, I noticed a couple of specks but nothing else, though grain seemed abnormally heavy. Blacks were too dense and inky, whereas contrast felt off, as the movie usually appeared too bright. Shadows showed decent delineation, though the overly bright feel meant they didn’t come across as especially natural. The brightness also impacted colors, as these tended to see pale. The film’s palette tended toward a semi-yellowish impression, and the hues lacked real depth or impact. This was all still good enough for a “C”, but the movie never offered strong visuals. Don’t expect much from the flawed DTS-HD MA 5.1 soundtrack, as it came with a few concerns. The soundscape itself tended to lack ambition, so most of the audio concentrated on the forward channels. In that domain, music spread across the speakers, but these elements didn’t demonstrate especially concise stereo presence. In addition, localization of dialogue became an issue, as speech blended across the front channels in a mushy, awkward manner. Effects used the five speakers in a wide but rarely precise way. These components didn’t attempt a lot and when they did, they failed to convey a vivid setting. Not only did the mix lack ambition, but also it suffered from mediocre quality. Dialogue tended to be thin and edgy, and effects showed poor foley work. Balance was off, which meant quiet elements – like simple walking sound effects – became too loud. This meant those elements came across as awkward and unnatural. The mix usually offered an odd “canned” sound that created distractions. Music fared best, as the score felt reasonably vivid. Otherwise, this was an awkward, amateurish soundtrack that fell below 1999 standards. As we shift to extras, we find an audio commentary with writers/directors Daniel Liatowitsch and David Todd Ocvirk. Both sit together for this running, screen-specific look at story/characters, the film’s title, cast and performances, sets and locations, effects, and related domains. At times, the track manages a decent array of moviemaking thoughts. However, the directors too often do little more than joke around, and I can’t claim we learn a whole lot about the film’s creation. There’s enough here to merit a listen but the commentary largely underwhelms. A short film entitled Superhelden runs 10 minutes, six seconds. A Super 8 flick Liatowitsch created at the age of 12, it depicts some kids who start a rock band to impress girls. Superhelden seems more professional than you might expect from this kind of project, but it feels oddly pointless. It remains unclear what Liatowitsch hoped to achieve with the film – other than to impress girls, which is a pretty good motive at 12 or any age, really! We can view the film with or without commentary from Liatowitsch. He gives us some background for the movie and some tragic connections that make it personal to him as well as its impact on Kolobos. This turns into a surprisingly strong chat. Four featurettes follow, and we open with Real World Massacre. It goes for 22 minutes, 10 seconds and includes notes from Liatowitsch, Ocvirk, and co-writer Nne Ebong. “Massacre” discusses the movie’s path to production, inspirations/influences, casting, photography, sets and locations, character design and various effects, editing, reshoots and release. Although “Massacre” repeats some info from the commentary, it provides a much more concise, direct view of the production, so it becomes a pretty strong examination of the film. With Face to Faceless, we locate a nine-minute, 44-second interview with actor Ilia Volok. The man behind “Faceless”, he tells us about his performance and experiences during the shoot. While not the most insightful program, we get a few good thoughts. Next comes Slice & Dice, an eight-minute, 37-second reel with composer William Kidd. He brings a nice discussion of his score for the film. Finally, we get Rediscovering Kolobos, a five-minute, 52-second look at a 2018 fan screening in the UK. It includes a unique message from the directors but otherwise seems forgettable. In addition to two trailers – one 1999, one 2014 – we get an Image Gallery. It provides 31 photos from the shoot and gives us a brief but fun look at the production. Nothing about the premise of Kolobos dooms it to failure, but the film’s execution acts as its cause of death. Amateurish and over-done, the movie lacks any kind of scares or tension. The Blu-ray comes with erratic picture and audio as well as a fairly informative compilation of supplements. As a movie, Kolobos shows few signs of life.